What would it be like to live in a retirement home designed for the future? When Skyhill designed Myntan retirement home, commissioned by Nyköping Municipality, they chose to focus on what it would feel like to live there. "It was our ambition to make each and every ward at Myntan feel personal and cosy, despite the large size of the facility. Therefore, the nursing stations, staff changing rooms and break rooms are situated right next to the residential wards themselves," Magnus Jansson, architect MSA at Skyhill, tells us. To the extent of their abilities and wishes, Myntan residents are given every opportunity to be independent, follow their personal interests and live as they want. The design of the flats has been greatly influenced by the need to provide a safe working environment and by the limitations that the financial framework put on the surface area. The focus was, nonetheless, to create a homely atmosphere and to offer positive visual distractions. Each flat has a French window for ventilation and a large bay window that provides a beautiful and exciting source of natural light. The floor plan gives residents a good deal of space for plants and photographs, for example, and windows are placed low enough that residents can see out even when lying in bed. The selection of materials was of great importance. To give a homely feeling and for the sake of durability, we selected oak veneer for interiors and flat doors and solid wood oak for bases and linings. In the kitchens and pantries we used beautiful granite ceramics the colour of sandstone, and in the bathrooms dark grey mosaic contrasts with white tiles. 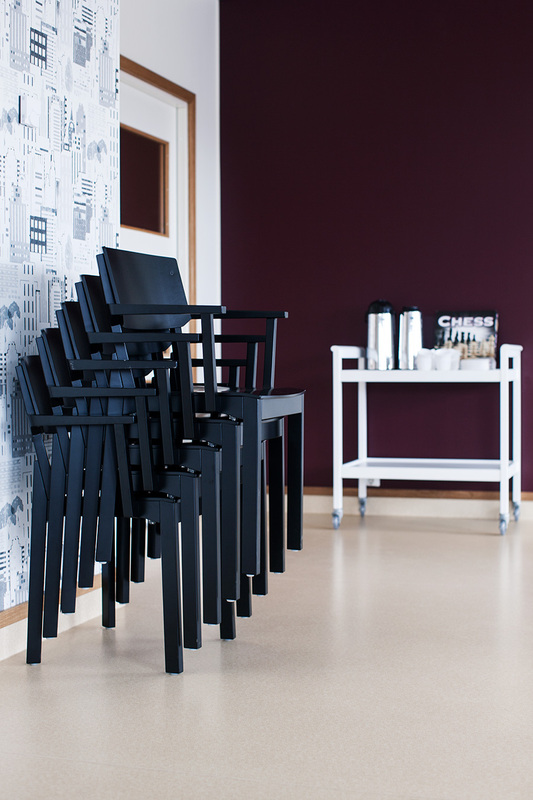 The easily stored and stacked Knut chair makes it simple to vary the way a room is used. The Kurbits sofa offers a good place to rest after a walk and invites neighbours to get together. 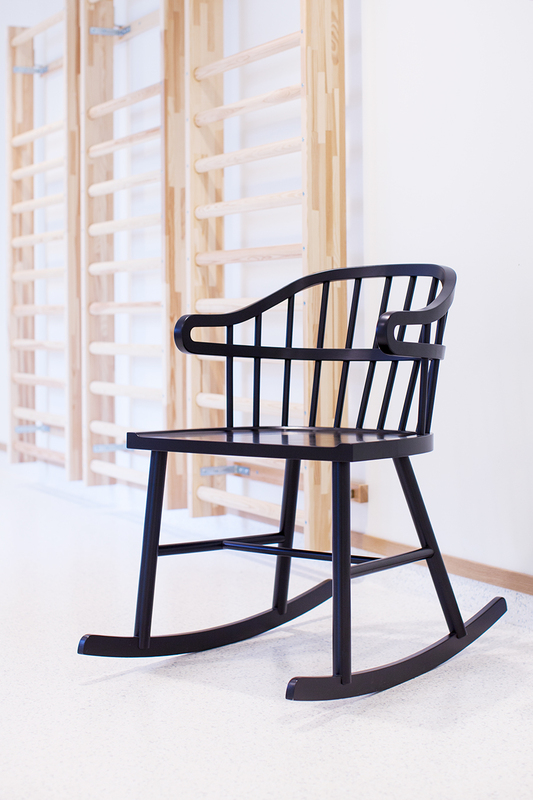 The stylish, timeless Curt rocking chair has a stimulating effect, regardless of where it is placed. The flats have been fitted with a number of practical solutions to meet the residents' desire for independence and the staff's need for good ergonomics. The bathrooms are equipped with special interiors: for example, height-adjustable toilets and washbasins. There is a pass-through cabinet to the hall, which enables the resident to maintain independence for as long as possible. Inside the flats there is also a small pantry, with one wall cabinet designed as a drip-dry cabinet. The communal areas have been furnished according to the same principles. All day rooms have wide French doors opening out onto large terraces and balconies. Even residents who are not able to go out on their own but still wish to feel the raindrops on their faces or the wind through their hair can be rolled out in bed. There is a shared dining area, kitchen and washing up room adjacent to the day rooms. The kitchen has been designed to function as an efficient work kitchen with a good working environment for the staff, but also as a large home kitchen. After all, it is the residents' kitchen! In each ward, there are generous spaces for socialising. 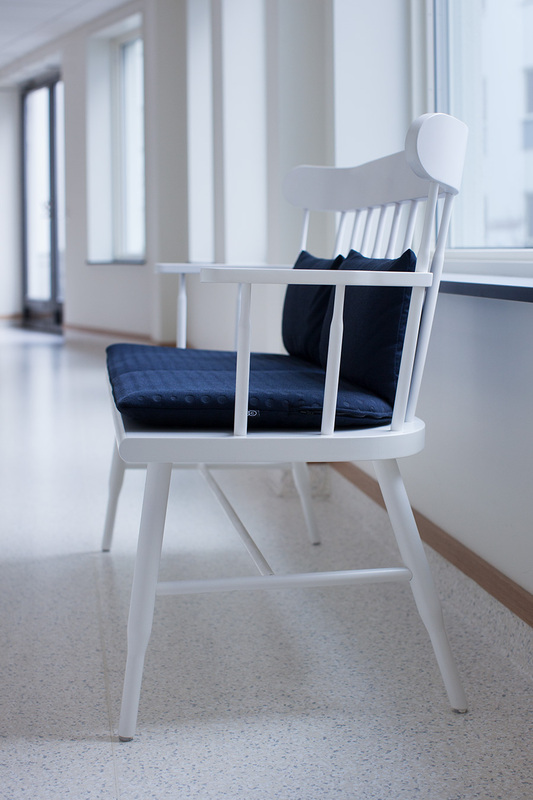 All art, paint and materials in the wards have been selected in collaboration with staff representatives and the retirement organisations in Nyköping. Whether it be a lounge, a waiting room or a room for socialising such as the café or canteen, a welcoming environment needs to be flexible. The tables need to be customised for wheelchair access, if this has not already been done. Chairs should be easy to move and should not make too much noise in a quiet environment. Furnishing Myntan's activity room with Knut chairs enables the room to be transformed easily from an inviting lounge into an undulating dance floor. "I think bright rooms and lively colour scales are important for creating a homely, wonderfully varied indoor environment." Dining room furnished with Björn chairs and Knop tables. Customised to maintain a pleasant level of acoustics while offering inviting furniture.